The implications of AI’s unique approach are profound: AI can learn by example rather than through brute-force programming; can understand human intention and emotions and act accordingly; and can handle extraordinarily complex relationships of data that are beyond the capability of human analysts working alone. AI can multiply what we currently do and take us to experiences we’ve never had before, at a speed and scale that will change entire industries. In these case studies, we’re pleased to present a range of real-world examples to guide your imagination. Here, you’ll find situations where companies like yours found AI to be part of the solution. These examples show how AI can enhance an existing application, workflow or process and reduce friction. 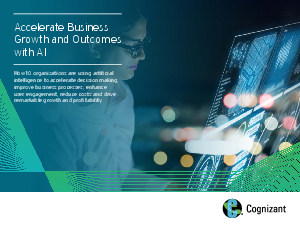 This e-book presents how 10 organizations are using artificial intelligence to accelerate decision making, improve business processes, enhance user engagement, reduce costs and drive remarkable growth and profitability.